As well as protecting your boat you should consider installing the right safety equipment to protect yourself. All the following equipment can be bought from any specialist supplier of chandlery equipment. These are a must and should be loud enough to be heard over the sound of the engines at full throttle. At that level, they should also be audible to other people in the marina if a fire breaks out in your absence. Every boat should ideally carry a minimum of one small fire extinguisher located at the exit to each cabin, in addition to a fire blanket if cooking facilities are provided. 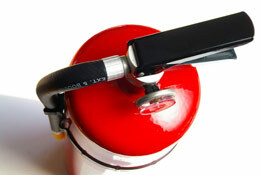 If the vessel has an enclosed engine space it is recommended that a fixed automatic fire extinguisher be installed. Both the RNLI SeaCheck scheme and the RYA boating safety guidelines also recommend carrying one larger general purpose fire extinguisher mounted in the main cabin or saloon area, and the fitting of an LPG gas alarm and a carbon monoxide alarm if cookers or other flame burning devices such as heaters are installed. This is a small radio transmitter that sends out a coded signal on a special frequency used internationally for distress purposes. The signals are picked up by a network of satellites that can locate the approximate position of the EPIRB and then relay this information down to a rescue co-ordination centre. Every EPIRB that operates on this 406 Mhz satellite frequency must be registered with the national coastguard authority and therefore as soon as they receive a distress signal they will be able to identify who the vessel is, its approximate location, and whom its shore based contacts are. These are an essential part of any safety equipment inventory and are still the most instantly recognisable signal that someone is in distress. Personal floatation devices come in two main forms – buoyancy aids and life-jackets. A buoyancy aid is designed to keep someone afloat. It allows the wearer full movement whilst an active sporting activity is carried out. However, if unconscious, the wearer’s head could be face down in the water. A life-jacket has a buoyancy distribution sufficient to turn the user to a position where their mouth is clear of the water, even when they are unconscious. Always wear a life-jacket when abandoning ship. Specialist life-jackets are available for infants and children. Remember that inflatable life-jackets and buoyancy aids require regular checks and servicing. A buoyancy aid in a sailing dinghy, personal watercraft, windsurfer, canoe or water-skiing or if providing safety cover for such an activity. A life-jacket in an open boat such as a small power boat or when going ashore in a yacht tender. A life-jacket at all times on a yacht or motor cruiser if you are a non-swimmer and when there is a possibility of entering water. Also when the skipper deems it necessary. A first aid kit is the most frequently used item of safety equipment found on a boat and should be kept fully stocked at all times.